What is your project's analysis debt load? What's the difference between good and bad analysis debt? What are causes and remedies for such debt? Mary Gorman and Ellen Gottesdiener explore the concept of analysis debt and consider strategies for prudent investing. What can happen over a game of golf? You learn what you don't know, you learn more about what you do know, and you learn to listen to what others know. See how two managers and a caddy team up for some valuable lessons about staying out of the rough. Knowledge doesn't just exist; we build it. Sometimes we disagree on what we've got, and sometimes we disagree on how to get it. Hard as it may be to imagine, the experimental approach itself was once controversial. What can we learn from the disputes of the past? How do we manage skepticism and trust and tell the testing story? 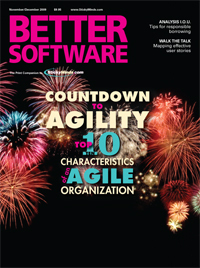 A software tester re-examines the role of software testers in quality assurance work, helping implement software development processes. If testers are knowledgeable, helpful, and supportive, they may be in the best possible position to help the team improve its software development process. In a counterpoint to his previous Technically Speaking column, Lee explains why holding fast to one's beliefs is not necessarily a bad thing. While the idea of a user story is simple on the surface, there are challenges to working with them. User story mapping is a useful way to organize, decompose, and prioritize user stories. Another pair of eyes will find bugs, but code reviews are traditionally time consuming and painful. Learn how modern, lightweight techniques make code reviews effective and practical. Jean Tabaka believes in the power of an entire agile organization. These ten characteristics of an agile organization may seem counter to market success, but she explores why they are wholly embedded in twenty-first century business success.